Back in the late 1990′s I purchased a few seeds from Fran Harding. I was guided to her from Shirley Farmer. Jamie Gossard , Shirley and I all bought seed from her out of FORESTLAKE RAGAMUFFIN. Each of us bloomed a few noteworthy daylilies. I was fortunate enough to bloom SEE ME FEEL TOUCH. Its been a valuable breeder for us and has been a very nice garden daylily. The seed business and seed give aways are still going strong today thanks to the newest generation of seed entrepreneurs. Mike Longo’s Lily Auction is a favorite place to sell seed. Bill Gutfleisch has a nice collection of teeth seeds now available on the Lily Auction. A close look at the bidders on Bill’s auctions show even the Jamie Gossard is still bitten by the teeth auctions. 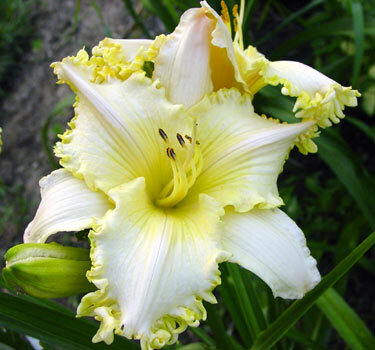 http://www.daylily.com/cgi-bin/auction.cgi?dispseller&sellername=Pollen5 . As for persons who give seed away, John Kulpa comes to mind. I remember how proud Jane S. was when she picked up a few of John’s seed give aways at a daylily meeting. FYI, I’ve been getting several emails wondering when Larry Grace’s daylilies are going to be online. Soon. I can also tell you that Larry is staking his claim to this years Dentist Award. Stay tuned! This entry was posted in Daylily Hybridizing, Introductions and tagged Bill Gutfleisch, daylily, daylily blog, Jamie Gossard, John Kulpa, mike holmes, Mike Longo's Lily Auction, SEE ME FEEL ME TOUCH ME, teeth. Bookmark the permalink.